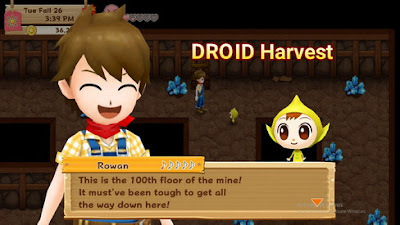 Welcome back to Harvest Moon: Light of Hope guide. In this page, we are going to talk about some problems related to mining and ores. Mining is a very important activity because you can get ores and refine them to gems for sale to get a lot of money, used to repair buildings and upgrade your tools. In addition, there will be a quest where you are required to get one of the ores from the mine. The most important thing is you have to get a Hammer first. I assume you've already unlocked the Mountain area after you place the Second Stone Tablet in the Lighthouse. When you first enter this area, you will meet Naomi and Sally. Naomi will give you a map of Beacon's island that not only serves as directions, but you can also see the location of the villagers in real time. In addition, they also recommend you to repair the mine in advance rather than other buildings. So, the first thing you should do is repair a bridge (there is a broken stone tablet in front of this bridge) that lead you to the central area of the Mountain. There, you will find Gus' house (Gus' Smithy) and the mine. Repair both of them. After repair Gus' Smithy, there will be an event where you meet Melanie (Gus's granddaughter) if you visit the mountain area on the next day. She's thankful to you because you have been repaired her grandfather house. Next, you will be asked to find Gus by Melanie, find him in front of the mine. Then, you will be asked by Gus to find an Iron Ore inside the mine (found a lot at level 5-6). For that purpose, you will be loaned a Hammer by him. After completing this quest and bring back Gus to his home, he will ask you to keep the Hammer that he gave before. Now you have a Hammer to mining and crushing some rocks. Gus also can upgrade your tools and refine ores into gems for you. You are required to crush/destroy the rock (Ore) appearing in every room of the mine to get different types of ores. Next, you need to find a ladder to go down to the next level. The deeper you dig, then the ore you can get will be more expensive. Each time you successfully pass 5 floors of the mine, there will be a checkpoint thereafter, and later to arrive at level 100. This is very useful if you want to get into the mine again, so you don't have to mine from the beginning, but you can start from the checkpoint room. But keep in mind that if you leave and enter the mine in short of time without going down to another floor, you will lose about 2 hours time. From level 1 to 30, the ores color still black and you can use Gus's Hammer to destroy them. From level 31 to 60, the ores color becomes orange. You need Expert Hammer to destroy them. From level 61 to 100, the ores will be blue. You need Master's Hammer to destroy them. 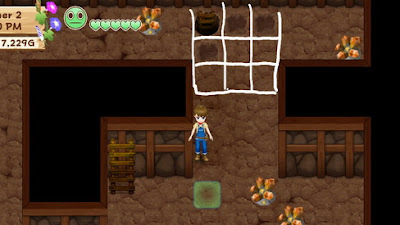 To did that, I used the same tricks in Harvest Moon: Seeds of Memories. But there is a difference, in SoM you could use Save/Load trick, while in the Harvest Moon: Light of Hope you can't do that. We're greatly facilitated by the presence of checkpoints, as I've explained above. In essence, I call this tricks '3 x 3 or 4 x 4 plots'. So, if there are any ores in the 3 x 3 (9) or 4 x 4 (16) radius squares, then the ladder to the next floor will not be there. But if in the 3 x 3 or 4 x 4-radius there are no ores at all, then the ladder must be within the radius of it. So, just dig that area, start from near the wall and move to the middle of the room. The 3 x 3 trick started to be used for level 6 upwards, while the 4 x 4 trick, can be used for mine level 51 and above. If you upgrade your Hoe, it will be easier and faster for you to find the ladder to the next floor. Don't forget to carry some food to restore your stamina, I suggest you carry some bread, milk, egg, or other cooked food that can give you a lot of stamina. You can get Mithril ore started at the level 31 upwards. You can get Orichalcum ore started at the level 36 upwards. You can get Diamond ore started at level 41 upwards. Adamantite, Pink Diamond and Soul Gem Ore can be found at level 61 upwards. That's Mining Guide in Harvest Moon: Light of Hope. I hope this article could help your problem, thanks for reading this article.